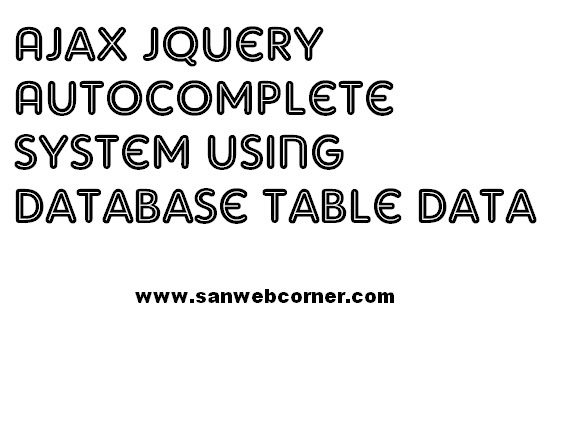 In this post i will tell you how to create Jquery ajax autocomplete textbox with mysql database table. This example is really helpful and it is very user friendly because instead of type the full text will give the perfect suggestion to the user. So the user easy to select the particular text from the suggestion. This auto complete text will shows when the user enters one or more text in the text field. Here i used the ajax concept so without page loading the data will be shows instantly. It may used for search box or any other text boxes in the form fields. The below example have the live demo and the source code. Use this code according to your project requirments. Autocomplete is very useful and important concept, It giving the user a list of matching results as they type can both save the users time and offer them an exact list of results. So this is one of the simple and important concept. I hope this post is very useful.